Photo: Jamal Khashoggi speaks at the Middle East Monitor in London in September 2018. Reuters is reporting footage of the transfer of slain journalist Jamal Khashoggi’s remains in suitcases has been aired on pro-government Turkish television. 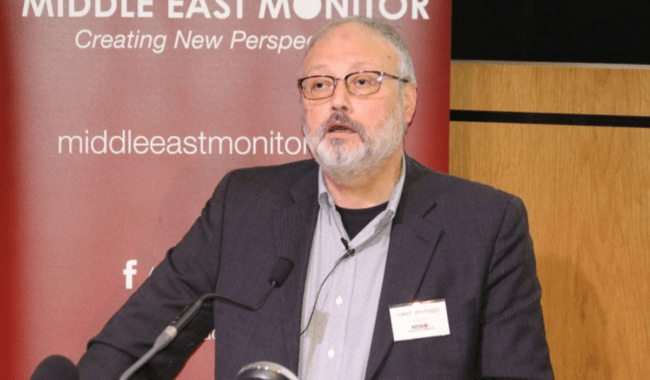 According to the article, the video “shows men carrying what it says were a total of five (suit)cases through the main entrance of the residence, a short distance from the consulate where Khashoggi, a leading critic of Saudi policies, was killed in early October.” The residence in the video belongs to Saudi Arabia’s consul general. Khashoggi, a U.S. resident and royal insider, was murdered allegedly for his criticism of Crown Prince Mohammed bin Salman, who is also alleged to have ordered the murder. Follow The Burton Wire on Twitter or Instagram @TheBurtonWire.